Soon after entering this world our eyes are anatomically fairly mature and capable of resolving quite tiny detail, but we have to learn how to use them properly to understand our visual world. Like a camera, each eye or visual channel must be focused at the correct distance in order for us to see clearly. In early infancy the two channels work independently and we must also learn to integrate them, operating them together as a pair. During early movements, hand to mouth and crawling stages, we “measure” space using our body movement through it, and repeatedly compare this spatial information with the visual impression of space received through the eyes. By means of this constantly repeated sharing and comparing of information through the different body senses we refine our understanding of space so that we no longer require support or feedback from other body systems, such as touch, to know exactly where things are. This is essential to efficient focusing and eye alignment for effortless clear and single vision. 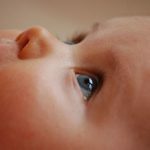 This matching and combining process continues throughout our life and, consequently, the way we use, or don’t use, our bodies in sickness and in health influences the quality of functional control over the visual system. Think of the way that children hurl themselves around, rolling, jumping, stretching, skipping, twirling, dancing, crawling, lunging, under things, over them, inside them. As we mature we move much less and in more regimented, repetitive movement patterns. Limitation in movement, or undue effort to achieve movement, common in many conditions, such as arthritis, will limit or distort essential spatial feedback from body to visual system, and functional visual skills will eventually begin to suffer.